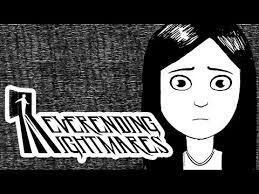 Vivid dreams, scary dreams, and nightmares have plagued my nights and my desperate afternoon naps for the last five weeks. Normally, I am not a vivid dreamer or even one who can remember a snippet. These five weeks have been anomalous, and, quite frankly, they have been tough, exhausting weeks. This morning at 4:47 I awoke from yet another nightmare. I was invited to a nice upper-middle class country club pool for an event that took place in the dark of night. When I arrived I saw all the contents of my office on fire—my computer, my copier, even my desk chair. The country club members had purposefully torched them so I couldn’t work anymore and wanted me to be there to bear witness to it. Readers, those three sentences do not do my dream justice; it was horrific. I just want you to know that I woke up scared and cried myself back to sleep. I know where these dreams come from because five weeks ago I found out that my job was being cut by 42.8% on February 1. I also know this: I am a single mom of two, earning my master’s degree, and I will not work for 42.8% less. So, I resigned. My last day is Friday. I have been absolutely blown away at people’s reactions to my news. My 20-something friends didn’t want me to leave my job until I had something else lined up. My 30- and 40-something friends could identify my fears because they understand that this could be them, too, at any minute. My 60-something father lamented that it was bad timing. It was my 88 year-old friend and my 93 year-old grandmother who surprised me the most. When I told Ms. Jean (my most understanding and wonderful volunteer here at the church where I work) that I resigned her response was, “Good! I have been wondering when you were going to resign. You need something more than this!” My grandmother had a similar reaction when she told me she thought this was the greatest thing. My decision to resign without another job (and two kids, two cats, and a dog) will be considered brave by some and foolish by others, but the key is perspective. I will admit that I was surprised by the reactions of Ms. Jean and my grandmother, but when I thought about it I realized they had seen so much more life experience than my 37 years. Just a few days ago I came upon this article that affirmed this conclusion. Number 7 speaks to me. 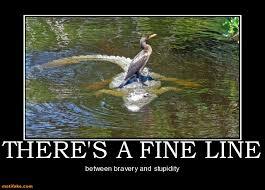 In taking time to craft the story of my life I will choose adventures some may deem foolish and others deem brave. I have to be okay with my decision for I am the one living my life. In fact, I know that this is the BEST decision for me except my dream from this weekend has led me to question my bravery once again. Since I quit my job I have attended a writer’s workshop, been asked to preach one Sunday in February, solo-hiked 5 miles in a peaceful nature sanctuary, and read a piece at an open mic poetry slam. These are BRAVE things for me. Adventurouslyauthentic.com was created as a place to bravely share my vulnerable soft underbelly with you, Dear Readers, so we can know that we are not alone. Blessings to you, Readers! Let’s be brave together and lean on those who have a different perspective! And, in the meantime, I ask you to share my blog with your friends and send writing and speaking jobs my way! Got 20 minutes? You must watch Brene Brown’s TedTalk on the power of vulnerability. may be brave, but it’s okay to be scared, too. Courage isn’t the absence of fear; it’s going forward anyway. Sounds like there have been wonderful moments of grace in this transition time. Keep writing! Wow, Elizabeth. Scary for sure – but if you don’t have a writing career in front of you, nobody does! Look for journalism opportunities at the newspapers. You’re a natural! It’s not really about being brave or foolish, though, is it? It’s about knowing that you are allowing the Holy Spirit to guide you. Like Indiana Jones’ leap of faith. The pillows at the bottom of that cliff will be angels’ wings ushering you into the next EXCITING chapter in your life. I can hardly wait to sit with you over a cup of coffee in a few weeks and see where you’ve been led. You are not alone with the sleepless nights. I too have had some horrific dreams. The kind that wake you and make you feel relieved they were dreams. The pressure on me concerning church affairs has been enormous. Sometimes I ask myself, God is that really you speaking. The pressure has been overwhelming. As for your situation, I know there is so much more for you out there. Not to say that your ministry at our church was nothing short of spectacular. I’m feeling a lot of remorse and sadness with joy all at the same time. Talk about confusing. But you know I do feel (physically and emotionally) God sharing the yoke, he reminds me in stressful times I got this, share with me. I too, am being bent and stretched into I don’t know what yet, but I anticipate something GOOD! 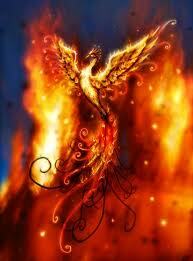 I love the thought of the Phoenix rising from the flames! Stronger than ever.